If you’ve been following me for a while then you know I love Google AdWords. AdWords search advertising is one of the most targeted forms of advertising because you can show your ads when your prospects are in the act of searching for your product or service. It doesn’t get much better or easier than that when you’re trying to match your offer to what your prospect is looking for. AdWords also provides excellent reporting and tracking tools to measure return on investment. Oh and there’s no minimum investment to get started, and you only pay when prospects actually click on your ads… See what I mean? AdWords can be an amazing tool to drive leads and sales for your business. With that said, I’ll be the first to admit that AdWords is NOT right for every business. Whenever I talk to a business struggling to profit from AdWords, then 9 times out of 10 it’s because they are not following best practices. However, there are a handful of cases when AdWords is simply not a good fit. So in this article, I’m going to walk through the 5 questions to answer to make sure AdWords is right for YOUR business. 1. Are Your Prospects Searching in Google? This one should be obvious. The only way AdWords search advertising is going to work is if your prospects are going to Google.com and searching for your product or service. If no one is searching for your products or services, then no one is going to see your ads. That’s pretty straight forward. Since the #1 goal of advertising should be to get customers, we’re primarily concerned with the shoppers. Researchers will click on ads, but they don’t tend to buy anything. Keep this in mind as you’re using Google’s Keyword Planner Tool to find out IF (and then what) your prospects are searching in Google.com. 2. Do You Have a Compelling Offer? Assuming your prospects are searching to buy what you have to sell, then the next step is to review the competitive landscape. How does your offer stack up to all the other ads already showing in Google’s results? Are you offering the same product or service at the same price? Is there anything that makes your offer more compelling? If not, then you’re going to struggle. Think of your offer like the quarterback of a football team. Even with a roster chock full of superstars, the team is going to struggle with a lousy quarterback. On the flip side, a superstar quarterback can more than make up for a mediocre roster. The same is true with AdWords advertising. If you do everything else perfectly, but your offer is weak, then your campaign is most likely not going to work. However, I’ve personally seen campaigns set up incorrectly, but they were still profitable because the offer was so strong. So the key action item here is to review the competitors’ ads and offers for all of the keywords you found in the previous step. Then make sure your offer is more compelling for your prospects. 3. Do You Have a Sufficient Test Budget? Very rarely is an advertising campaign profitable right out the gate. Usually it takes some tweaking to find the best search keywords, bids, ads, and landing pages. So it’s best to think of the first couple months as your testing period. If you can break even, then that’s a win because you’ll be able to optimize the campaign to make it profitable. With that mindset, you need to set aside a test budget. But how much? That’s one of the most frequently-asked questions that I receive each month. 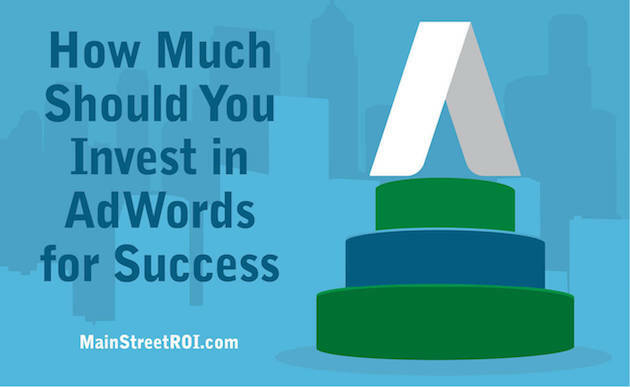 How much should you invest in Google AdWords? It’s impossible to answer that question without first completing the keyword research using Google’s Keyword Planner Tool (see section above). The Keyword Tool will give you the estimated cost per click for each of your target search keywords. That tells you approximately how much you’ll spend when a prospect clicks on your ad. Next we can use some basic math. If you expect to convert 1% of your visitors into sales, then you’ll need 100 clicks on your ad to generate a sale. 100 multiplied by the estimated cost per click from the Google Keyword Tool will give you the cost per one sale. For example, your budget to generate 1 sale from a keyword that costs $5 per click will need to be about $500 (100 clicks x $5 = $500). Of course, this depends greatly on the estimated conversion rate of 1% so I recommend you calculate a range of budgets using different conversion rates. This will give you an idea for how much you’ll need to spend to generate just one sale. Related article: How much should you spend on Google AdWords? 4. Do You Have a Shot At Being Profitable? Now that you know how much you’ll need for a test budget, you’ll want to double check the numbers. Do you have a shot at being profitable with your estimated cost per clicks and conversion rates? Or are you setting yourself up to lose money even at the highest estimated conversion rates? Unfortunately, this step is often overlooked and it can be painful to realize you have no shot at being profitable after you’ve gone through all the work of setting up and testing your campaign. 5. Do You Have Sales Tracking? The final step is to make sure you have a system to track sales from your AdWords campaign. The only way you’ll be able to measure success is if you track leads and sales generated directly from AdWords. AdWords provides online tracking to see which keywords and ads are generating e-commerce sales and webform submissions (i.e contact forms). AdWords also recently released offline conversion tracking that allows businesses to upload sales generated off of the internet. Plus, I recommend phone call tracking so you can see how many calls were generated from AdWords, and how many of them led to sales. If you can answer ‘Yes’ to all 5 questions above, then for the reasons I listed at the beginning of this article, I highly recommend you set up and test a Google AdWords campaign. If you were shaking your head ‘No!’ to one or more of the questions, then it’s absolutely critical to get those areas fixed (if possible) before you advertise. Remember, AdWords can be an amazing advertising tool, but only if you can answer ‘Yes’ to all 5 questions above! Good day, Phil. Thank you for this needful information to my address. Best Regards, Sergey . I’d say that $500 to pick up a sale was pretty good. More important is the things you learn about your audience, because all that tweaking you’re talking about is you trying to meet THEIR NEEDS. All the stuff you learn from Adwords you can use in flyers, cold calling, magazine articles – on your blog and even on Facebook! $500 might seem expensive until you realize what you’ve learned from it. Hi Gemma – I completely agree. One of the key benefits of AdWords is that it’s one of the fastest ways to test your marketing message. For example, you can test dozens of different ad headlines and descriptions to see which messages resonate with your target audience. Then use the best headline/description combination in your other marketing materials. It’s much easier and faster to test in AdWords, then to split test TV, radio, print, or direct mail.